References BUFSIZE, UT_Win32LocaleString::c_str(), XAP_Win32DialogBase::checkButton(), UT_Win32LocaleString::fromLocale(), UT_Win32LocaleString::fromUTF8(), AP_Dialog_Columns::getColumns(), AP_Dialog_Columns::getHeightString(), AP_Dialog_Columns::getSpaceAfterString(), XAP_Win32DialogBase::isChecked(), AP_Dialog_Columns::m_answer, XAP_Win32DialogBase::m_hDlg, AP_Dialog_Columns::setColumnOrder(), AP_Dialog_Columns::setColumns(), AP_Dialog_Columns::setLineBetween(), AP_Dialog_Columns::setMaxHeight(), AP_Dialog_Columns::setSpaceAfter(), UT_DEBUGMSG, UT_UTF8String::utf8_str(), and UT_Win32LocaleString::utf8_str(). References UT_Win32LocaleString::c_str(), XAP_Win32DialogBase::checkButton(), UT_Win32LocaleString::fromUTF8(), AP_Dialog_Columns::getColumns(), AP_Dialog_Columns::getHeightString(), AP_Dialog_Columns::getSpaceAfterString(), AP_Dialog_Columns::incrementMaxHeight(), AP_Dialog_Columns::incrementSpaceAfter(), XAP_Win32DialogBase::m_hDlg, and AP_Dialog_Columns::setColumns(). 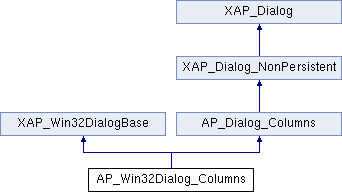 References AP_Dialog_Columns::_createPreviewFromGC(), _DS, _DSX, XAP_Win32DialogBase::centerDialog(), XAP_Win32DialogBase::checkButton(), Color, enableLineBetweenControl(), XAP_Win32Toolbar_Icons::getBitmapForIcon(), AP_Dialog_Columns::getColumnOrder(), AP_Dialog_Columns::getColumns(), XAP_Win32PreviewWidget::getGraphics(), AP_Dialog_Columns::getHeightString(), AP_Dialog_Columns::getLineBetween(), AP_Dialog_Columns::getSpaceAfterString(), XAP_App::getStringSet(), XAP_StringSet::getValue(), XAP_Win32PreviewWidget::getWindowSize(), GR_Win32Graphics::init3dColors(), XAP_Win32DialogBase::m_hDlg, XAP_Dialog::m_pApp, AP_Dialog_Columns::m_pColumnsPreview, m_pPreviewWidget, XAP_Win32DialogBase::setControlText(), XAP_Win32DialogBase::setDialogTitle(), XAP_Win32PreviewWidget::setPreview(), XAP_Win32DialogBase::showControl(), and UT_return_val_if_fail. References AP_DIALOG_ID_COLUMNS, XAP_Win32DialogBase::createModal(), XAP_Dialog::m_id, XAP_Win32DialogBase::setDialog(), AP_Dialog_Columns::setViewAndDoc(), and UT_return_if_fail. Referenced by _onInitDialog(), AP_Win32Dialog_Columns(), and ~AP_Win32Dialog_Columns().